What does one do when one is a self-taught letter cutter, with an insatiable desire to learn, who lives in the mountains of South West Ireland and thus has very limited access to places and people who are involved in the craft? Firstly - Read books, watch videos on the internet. Secondly - Try as hard as possible, by trial and error, to work the intricacies of the craft. Thirdly - Take every opportunity, when the chance presents itself, to talk to people and gain little nuggets of treasured information that can help you on your way. I have done the first and second options to death, leaving me in the frustrating position of constantly feeling that I have crucial gaps in my knowledge that continually hold me back and prevent me from being as good as I can be. So I took it upon myself to write a letter to Fergus asking if I could visit his workshop for a few days and get some hints and tips. Kindly, he replied in the affirmative and said I could come to England and visit him when he was not too busy. I was intensely aware that I did not want to disrupt him too much and just wanted a chance to watch, observe, practice and ask a few questions. So, I turned up on a bright autumn day. Travelling by train , it was a little difficult to get to the workshop in a surprising lack of public transport in the area. The Cotswolds! No buses ! You are kidding me . Upon arriving , Fergus and his wife Hannah gave me a nice lunch and we had a little chat as to who I was and what I wanted from my visit. My first impressions of the workshop were delightful. A lovely light, warm space oozing with examples of his work. Various headstones in different stages of completion. Plaques and other things of interest littered the walls. 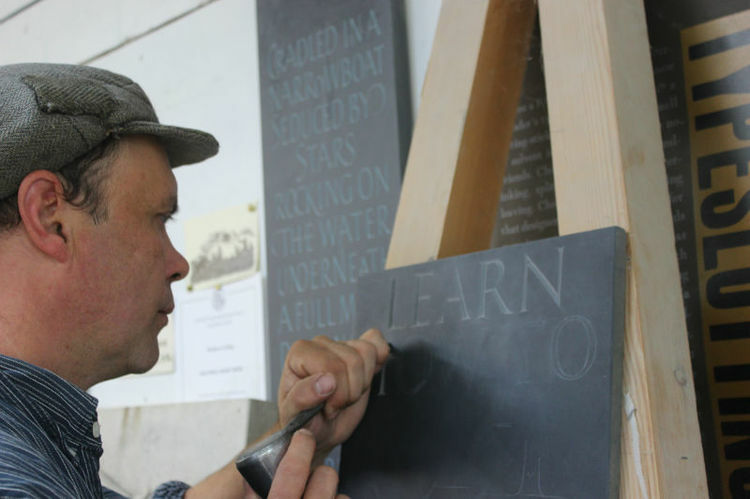 Fergus working on a lovely piece - a slate slab set into a limestone border with fine small lettering and a small coat of arms. His assistant, James, working on a portland limestone headstone. It took only two minutes to know that here was a place I could learn a few things. Work of the highest quality is not something I have seen a lot of and I could have left there and then and been a happy man. Fergus set me up with an easel, and on the piece of slate I brought with me, showed me how he draws out a line of wording and how he centres it. It took him 10 - 15 minutes. Ok - there's three year's learning for me there and then I thought. To see the confidence shown with the pencil and the concise nature of his strokes as he drew beautiful letters, compared to my messy lines and shaky letters, was cause for inspiration. This is something to aim for. Now, my turn to carve them. He gave me one of his chisels (because mine were sharpened in a way he, fairly, considered awful - I have never been shown how to sharpen a chisel ) which was sharper than one I have ever used and it was sharpened at a much shallower angle than I was used to. Leaving Fergus and James to their work, I carved the word he had drawn. It was tricky because the feel of the chisel was alien to me. Once finished, Fergus then cast a much appreciated critical eye over my work. He pointed out where I can improve. He told me, to my delight, that I did not have any truly bad habits but needed to work on my finishing. This I knew. 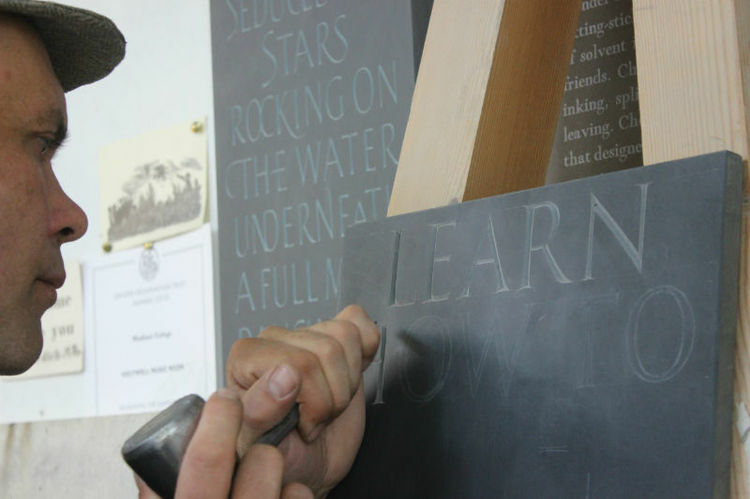 With a few strokes of the chisel, he transformed my, not too bad, letters into good letters.
" Take a little here ". "Balance the serifs ". "Get the letter sitting totally upright " and others were his words of wisdom. It was great to see what I needed to do to bring my cutting up a notch. I spent the rest of the day watching James carve the headstone he was working on and getting a few tips from him about chopping techniques which was one thing I wanted to improve. I also used my new knowledge to draw and carve a few more letters. I stayed the night at Hannah's parents house who, with immense kindness and trust, offered to let me stay there. For this I will be eternally grateful. I got lost in the Cotswold lanes, on foot and in the pitch black, trying to find the place. Adventures, adventures. Next day, Fergus asked what else I would like from him. I asked him to carve me an ' I' . He did this with me closely watching. I spent the rest of the day practicing what I had learnt and observed, with a few tips and comments from both Fergus and James. I also had the chance to ask questions about things such as stone, setting headstones, painting etc. that I have wanted to ask someone for ages. This was all done while all three of us worked at our tasks, so I was happy that I did not impose too much on their working day. James also, kindly, spent a few minutes showing me how to sharpen my chisels. The third and final day, I asked if Fergus could draw and carve an ' O ' for me. He duly obliged. The day followed the same procedure as the previous one with me just practicing and getting a few tips. Sadly, I had to leave the following morning. James gave me an appreciated lift to the station and my odyssey was over. So, was my trip worth it? ABSOLUTELY ! I came away with many things to work on - as I wanted. I learnt many, many small things that it is not possible to learn from the little literature available to me. To be in an environment of a working workshop teaches me many things that I am probably not even aware of. The process of Osmosis comes to mind. Just to be surrounded by the atmosphere, the work and the numerous carved pieces will have seeped into my soul and changed me forever. There will be times that my experience will come out in my work and leave me both surprised and thankful. I cannot truly express my gratitude to Fergus, James, Hannah and her parents for all the kindness they have shown me. Not only have I learnt many things but I have made some new friends. The best way to show my thanks is to now practice, practice, practice what I have been shown and bring the standard of my work up to new levels. Please know Fergus, James and Hannah that your immense kindness, hospitality and free giving of your knowledge and experience has not been wasted. THANK YOU!